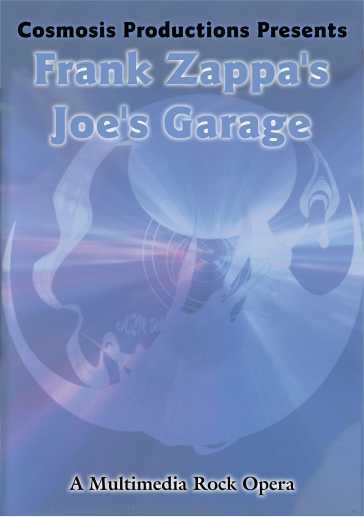 1999/04/16, Cosmosis Productions performed Frank Zappa's "Joe's Garage" as a live stage adaptation. The show featured a 7-piece band (feat. Ike Willis as a special guest), 6 modern dancers, a full cast of 10, a larger-than-life Scrutinizer, projections featuring character and digital animation, and quadraphonic sound design. The world premiere of the live stage adapatation of "Joe's Garage" was put on by Cosmosis Productions in Ann Arbor, MI in April 1999 at the University of Michigan by 50+ students, w/ sp. guest Ike Willis. The show featured a 7-piece band, 6 modern dancers, a full cast of 10, a larger-than-life Scrutinizer, projections featuring character and digital animation, and quadraphonic sound design. Shot with 6 DV cameras, the show has been edited and put on DVD. Jordan Shapiro: I was the musical director/guitarist/keyboardist for the production of "Joe's Garage" at University of Michigan in April 1999. There's a bunch of info about the show on the cosmosisproductions.com site, but I guess you probably already read that if you were on the site. all disciplines (visual artists, dancers, actors, graphic designers, animators, set designers, technical artists/designers, etc etc.) excited about being involved with the show. It turned into a very large-scale event, all run by students aged 19 - 21. Through a random connection, we got ahold of Ike Willis, who was thrilled about our production and our invitation to attend the production and become involved. (he sat in with the band for a bunch of songs). To his knowledge, at that time, there had never been a stage production of "Joe's Garage". (since then, I think it has been put on by other production companies). We had use of state-of-the-art equipment thanks to a VERY tech-savvy university, so we were able to document the show very well. The video editing process took about 3 years to complete, due to the fact that we all left the univeristy either that year or the year later and had trouble getting use of editing machines. But it is completely edited now, with interesting additional material added in to complement the feel and overtones of the piece. Thanks for the interest in the show.